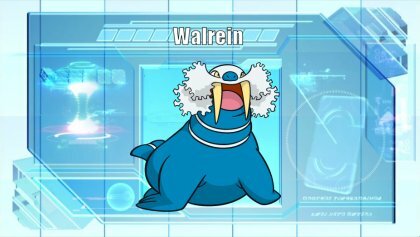 Walrein, The Ice Break Pokémon. Walrein's two massively developed tusks can totally shatter blocks of ice weighing 10 tons with one blow. This Pokémon's thick coat of blubber insulates it from subzero temperatures. Walrein swims all over in frigid seawater while crushing icebergs with its grand, imposing tusks. Its thick layer of blubber makes enemy attacks bounce off harmlessly. +	Walrein has decent Special Attack so it can hit decently hard, allowing it to get some surprise damage onto some switch ins with STAB moves. 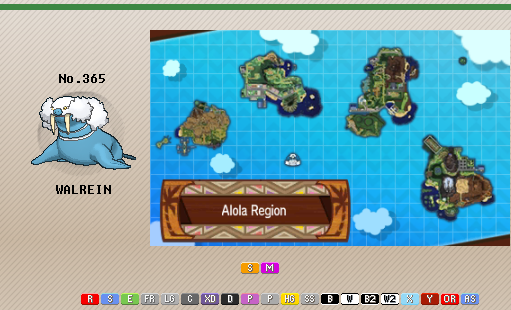 -	Walrein's typing is subpar. Ice gives is weakness to Fighting and Rock and makes Thick Fat necessary if you want to resist Fire moves. On top of this, Walrein is weak to Stealth Rocks, losing ¼ of its health switching into them. Ice Body - Heal 1/16th of the Pokémon's maximum health in hail - On a Hail team, this is the best ability as it allows Walrein to heal twice or run another item. Outside Hail however this is very underwhelming as its useless. Oblivious - Resists Attract - As Attract isnt that good in a competitive scenes, this isnt that great. Thick Fat - Halves Fire and Ice damage - Objectively the best ability, this negates the neutrality of Fire moves due to your Ice typing as well as make Ice moves tickle due to Walrein`s natural resistance to it. Toxic is the main form of damage most of the time, crippling walls and bulky threats that switch in such as Ampharos and Cradily. Roar is nice to phase out threats trying so set up on you or just rack up entry hazard damage. Surf is nice because of the STAB bonus but Super Fang can be better for work arounds on some threats, especially other tanks. Last slot is open to either Protect for stalling health and damage with Toxic or Encore to shut down tanks or boosting sweepers and force switches. Ice Body - This can be used more in higher tiers with Snover, but Walrein will have a hard time above NU and competes with other Pokémon but does the job well enough. Weezing - Weezing is a solid defensive wall, carrying Will O Wisp to cripple as well as switch into Fighting threats with ease, not fearing the average Earthquake because of Levitate. Weezing also has decent recover with Pain Split allowing it to heal and damage threats, Finally, more a type bonus, Weezing can use Black Sludge crippling Trick users. Trevenant/Gourgeist - I personally felt these two were interchangeable favoring Gourgeist more. However they both check Fighting types, a problem for Walrein, with their Ghost typing and can burn back with Will O Wisp. Trevenant is a more aggressive option lasting longer with Harvest for recovery while Gourgeist is more defensive, forcing things out with Leech Seed. Walrein is a Pokemon rarely seen in past VGC formats. Despite good bulk, it is in a weird speed tier where it is not at all fast, but it is not slow enough to be a true Trick Room sweeper. Even if it had a better speed stat, neither of its attack stats are impressive enough. 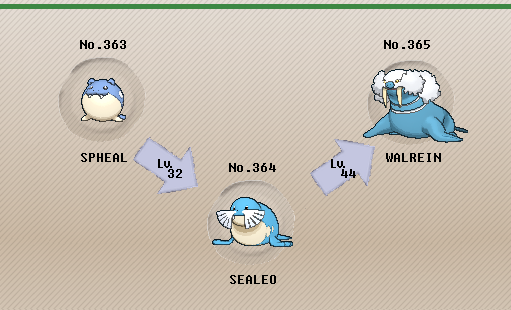 Z moves may have unlocked more potential for Walrein, but there are other Pokemon with better offensive or support potential that can do what Walrein does. A bit of speed can be added to Walrein's set if you have speed control to help it outspeed faster opponents, but otherwise max HP and special attack helps it take hits and fire back. Modest nature boosts its special attack, and the remaining 4 EVs are thrown into special defense to give opposing Download Porygon2 an attack boost. Thick Fat further fortifies Walrein's bulk, helping it easily switch in on ice attacks and essentially giving it another resistance against fire moves. A z crystal is the hold item to give Walrein some power to its moves. Waterium Z probably deserves the most consideration so that you actually have an option of a single-target water attack that will not harm your teammate, but Icium Z is also a powerful option when combined with Blizzard. Surf is really the only special water attack worth using, but it does hit Walrein's teammate. Blizzard is the strongest ice move, but with the poor accuracy, it probably needs Hail support or the option to use the z move. Ice Beam is weaker but has better accuracy than Blizzard, while Icy Wind provides some utility to support a teammate by slowing down the opponent. Protect is a staple in doubles to absorb attacks while a teammate takes care of a threat, or to stall out speed control on your opponent's side. -Ice Body can be considered if you have Hail support. Combined with Leftovers or a recovery berry, it can theoretically keep Walrein healthy. -Assault Vest can also be used on a support set with four attacks. -Signal Beam can provide bug coverage but really does not add a whole lot over your STAB attacks. Brine may have niche uses next to a partner with Super Fang or Nature's Madness. If you really need fire, grass, or some other coverage, Hidden Power is always an option. -A physical set is not ideal for a number of reasons, but you do get some more coverage. Belly Drum combined with a Sitrus Berry is one strategy, but with poor speed and no priority, it can be tough to pull off without a lot of support. Curse is another option to set up. Ice Fang is unfortunately the strongest physical ice-type move (not counting slow Avalanches, which is available from a generation 4 TM). Aqua Tail or Waterfall are better than Surf in the sense that they do not hit your teammate. Earthquake and Rock Slide provide spread damage, while Stomping Tantrum, Crunch, and Iron Head give additional coverage. -Stockpile can also be used for setup, but can only take you up three stages of boosts. -Super Fang is useful to weaken bulky opponents, and Toxic can also be used to wear them down. Roar can deny Trick Room, while Rock Tomb and Bulldoze also provide speed control. -When you have no other option...Sheer Cold. 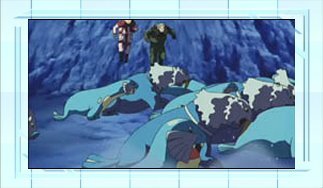 -Though probably not a great idea to have multiple ice types on a team typically, hail support helps Walrein's Blizzards. Alolan Ninetales with Aurora Veil is the most commonly seen hail user, but Abomasnow (either mega or Focus Sash, especially under Trick Room) or Vanilluxe (most effective as a Choice Scarfer usually) can also be options. -Lightningrod support helps with Walrein's electric weakness. -Walrein can help against some rain teams, especially if holding an Assault Vest and slowing the opponents down with Icy Wind. -Rain support boosts Walrein's water-type moves and can stop Solarbeams from Pokemon like Mega Charizard Y. -One way to make the Belly Drum set more effective is to have a Pokemon like Pheromosa use Speed Swap on Walrein. -Pokemon immune to water-type attacks with abilities like Water Absorb, Storm Drain, or Dry Skin makes good partners to freely Surf next to. Wide Guard users are another option to Surf freely next to, and can also keep Walrein safe from your opponent's spread moves. Passimian - Being a strong revenge killer as well as a Fighting type, Passimian can revenge kill Walrein with ease while not fearing to much in return. While Toxic hurts, it's not as bad as on tanks or wallbreakers due to revenge killers in and out nature. Ursaring - Similar to Passimian, Ursaring packs power Fighting moves as well as Guts and Quick Feet so Toxic can work against you giving either a power or speed buff respectfully and can lead to getting swept if timed wrong.